Coilovers with stiff springs (550/10k+). Camber adjustability Front and Rear (preferably with plates and bolts). The drive to make these work, this size doesn’t “bolt on” like other sizes. A dremel or fender roller or a hammer :D.
5×114.3 hubs are recommended mainly because of their out of the box durability and the wheel choices in 5×114.3 are much better than 5×100. Also a 9.5″ wide wheel that clears brembos and has an acceptable offset. This is a very basic “needs” list, what EXACTLY needs to be done to run an aggressive setup will depend on many different variables. On to the wheels that are available in 9.5″ that clear brembos. More will be added as the days go on. Specific fitment questions should be directed to drew@t3hclap.comas every setup is different and just because they clear brembos and the offset looks good doesn’t mean it will work. Some wheels are available in custom offsets and widths, but not all. Most 2 and 3 piece wheels can be ordered with custom offsets. Previous PostSubaru Challenge @ Gainesville, FLNext PostPastelito Racing wins Subaru Challenge Gainesville! The RPF1s in that size do not clear. It takes a much lower offset to clear the STi Brembos. The spoke design of the wide width RPF1s is not favorable for big brake clearance. They were designed for rear wheel fitment. very helpful indeed. What if stock coils are still used but appropriate negative camber is applied? More rub? Wouldn’t running say 10k F/R ruin balance? Stock Coils as in stock springs and struts? it’s all possible if you have a stiff enough spring (with a shock to match) as long as you’re willing to modify the fenders to fit exactly what you want. Coilovers make it much easier with their height adjustability and (generally) their ability to get more camber. Just adding camber usually isn’t enough b/c the compression is still significant, especially when on lowering springs. the 10k+ was more of a generalization. Ideally you want to run a stiffer front rate, although some people prefer to run stiffer rates in the rear and eliminate the sway bar. There are too many variables to list to be exact to everyone. it is possible to run this setup with a 10k/8k setup (f/r), just need to have the appropriate camber and ride height. I encourage any specific setup questions be emailed to get an answer that is more detailed to your own setup. Is an 8K rate to soft in the rear for some 9.5s? No, it is possible to use an 8k rear spring. You will just need a slightly higher ride height and potentially more camber and fender tweaks than someone with stiffer springs, but it is possible. A lot of the GT series doesn’t fit for squat, but I can add a few. I noticed there are no 18 inch wheels under the newly listed GT series wheels you updated. Is there a reason for this? I was looking at the GT-S in an 18×9 size but wasn’t sure on the offset as there are quite a few. read the title and you’ll know why i didn’t list 9″ wheels. there are no 18×9.5″ GT series wheels. I can help with the 18x9s if you want, shoot me an email. the 9″ article is in the works as well. What coil overs out there offer a stiff spring rate like 500 lbs/in F & 450 lbs/in R.
all of these are available with stiff enough springs to fit 9.5s. the ZZYZXs are built by ZZYZX and utilize a Koni Damper (your choice dual or single adjustable). All three are amazing combinations when paired up with camber plates front and rear. Hi, you seem to have the know how on STI fitment so here’s my question. Can i fit a CE28N with 30 offset on my 05 STI? Specs are 17 x 8.5jj offset 30.
it’s possible to make it happen, but it’s going to require a large amount of work and a narrow tire. read that to get an idea of what would be required. I sent u an email with a bunch of detailed info about my car. The more I think about it, I think a 17×9 with the proper offset is where I want to be. Is that doable with RCE t2’s? I think I want a 255 tire, maybe a 265. I have a 2004 STI, on stock struts with prodrive lowering springs. I am wanting to run a 18×9.5 +38mm **** Grid. Planning on a stretched 245/40/18 fitment tire, and rolling the fenders. Also am planning on getting camber bolts to get some negative camber in. ive heard from a few places this can be, done, i just thought id see what you had to say. First to fit the Grids, you’ll need a spacer as they do not clear brembos. (one of many reasons they aren’t on this list). After getting spacers/wheel studs you wont have fender issues if you roll the rear fenders, but that’s mainly b/c the Prodrives don’t lower the car much and you’re going with a skinny tire. you’ll most likely need to shoot for -3.0 front and -2.0 rear camber. Personally I’d stay away from **** but that’s me, and a topic for a different article. What about rubbing on the strut? How much of a spacer will i need? Wondering if you know whether Enkei RPF1s, in 17X9.5 or X10 will fit on an ’09 STI. And, if so, what offset should I use? oops, should have mentioned that it’s for track use only and I’m still on stock suspension. the 17×10 +38mm should fit nicely with the right mods. 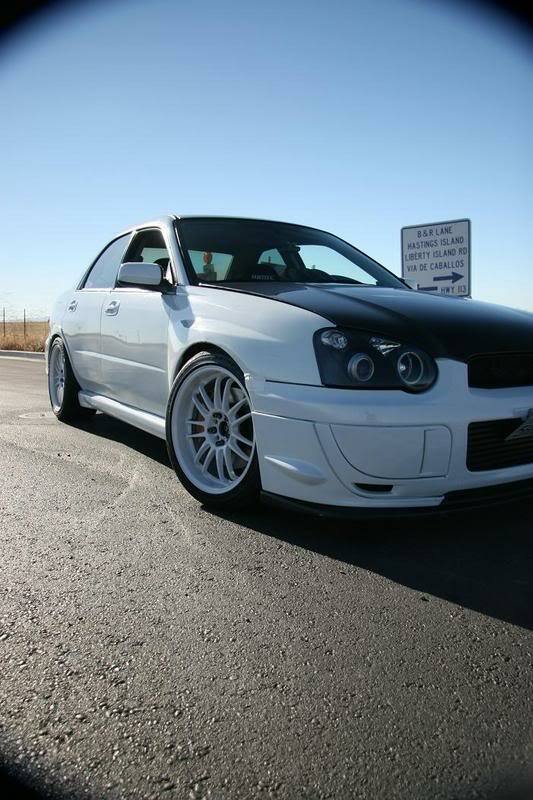 you will need to modify the fenders, run camber and run coilovers to make it all work. also, a little update to this. needs a 5mm spacer to clear brembos. Little dilemma this spring – I feel as though I may be putting the cart before the horse. Looking to buy new wheels/tires for my 06 sti. OE tires were shot last fall when i changed to winter tires. In short what im looking to do would be to run larger wheels/tires (17×9.5 with 245’s)for STU, temporarily until I can upgrade the suspension. If possible can you recommend what wheel will clear brakes, wont require a spacer and may work while still stock in a 9.5? Do you know if 17×9.5, 5×114.3, +43 offset 5zigen GN+ wheels will clear the brembos on an 05 STi and if it’d fit with minor modifications? I have JIC-FAS coilovers and i’m wanting to fit 255 tires on them. Wrx sti with 18×9.5 wide wheels +35 .hits front brembos whats other option to do now? It depends on your setup, we’ll need to go into more detail feel free to email me and we can go over it all in greater detail.